This exciting private trip starts as your flight lands in Beijing Airport. No matter when you arrive, our well-trained guide will meet you at the airport terminal with a sincere welcome. After a private transfer by good quality car for about 40 minutes, you will arrive at the comfortable hotel. Relax and recover yourself for the rest of day. Today what our guide presents you are the most visited sightseeing spots in the city center. It's favorable to explore the Tiananmen Square and the Forbidden City in the morning. You will have half an hour to stroll the world's largest city square and its surroundings before moving to your next stop to its north. As the top ruling royal palace for the last two feudal dynasties (1368~1912) in China, the ancient wooden building complex in Forbidden City is one of the finest examples in world architecture history. At about lunch time, you can ask the guide to take you to a restaurant named 'Old Beijing Cha Chiang Mein Noodles', which is only 450 meters walking distance east to the Gate of Divine Prowess. You can try good local dishes by yourself cheaply. A visit to the Summer Palace is scheduled in the afternoon. Built as the largest royal garden used for relaxation, the Summer Palace is still a good place to admire the best landscape in Beijing all year round nowadays. 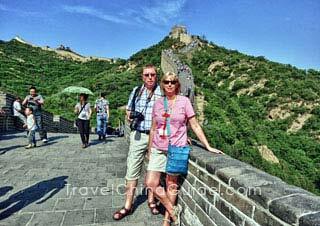 The Great Wall has always been a big hit for those who ever come to our capital city. It is advisable to have a hearty breakfast at the hotel and take some food with you as a simple lunch before you are escorted to the Mutianyu Great Wall. As a vital military defensive system in old times, the wall at Mutianyu possesses not only grandeur but also infinite beauty, which always fills visitors with awe and admiration. You will spend about two hours on the wall to fully appreciate its charm. The round-trip cable car is arranged. If you are used to having freshly cooked lunch, you can seek advice from the guide, who will be glad to offer you information on a good eatery. On the way driving back to downtown, you can see the Bird's Nest (Olympic National Stadium) and get some images of it. After that, you will be guided to visit the Temple of Heaven, which was the site where the Emperors during Ming and Qing Dynasties showed their pious fear and worship to the Heaven. It is two times larger than the Forbidden City, existing as another rare architectural wonder. The guide will give you a train ticket to Shanghai before saying goodbye to you at the hotel. Please keep it safely so that you can board the train without any trouble the following night. This day is reserved for your self-service exploration. After finishing the check-out procedure, you can still leave the luggage at the hotel concierge. You may begin your visit with Beijing Zoo, where you could see cute Giant Pandas and other rare animals. Leaving from the hotel, you are advised to move eastward to reach a T - junction, turn right and walk southward to East Chang'an Street and then go along the street for about 450 meters to the west, you will arrive at Tian'anmen East Subway Station. Take Subway Line 1 (to Pingguoyuan Direction) for two stops, interchange Subway Line 4 (to Anhe Qiao North Direction) at Xidan, you will arrive at Beijing Zoo after taking it for six stops. Next you can turn to the South Gong and Drum Lane (Nanluogu Xiang) for a Hutong experience. You could take Subway Line 4 (to Gongyixiqiao Direction) for three stops and leave from Exit C (southeast exit) of the Ping'anli station. Here you can go east for 70 meters and cross the street to arrive at East Ping'anli Crossing, from where we suggest you take Bus No. 118 eastward for 5 stops to reach the South Gong and Drum Lane. Alternatively, you can take a taxi instead of the bus for it only costs you less than CNY15. 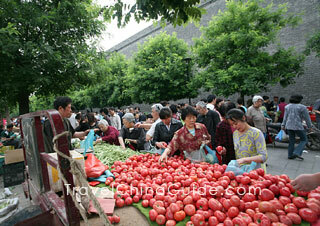 You could try some tasty local food as lunch when visiting the Hutong area. Also, riding a rickshaw through the narrow alleys will add a fresh experience to your trip. 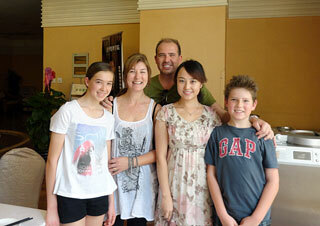 After that, you may return to the hotel directly by taxi at a cost of around CNY15. Alternatively, you can return to South Gong and Drum Lane Stop to take Bus No. 60 (eastward direction) and get off at Nanheyan Stop, from where you only need to walk less than 100 meters to get back to the hotel. We kindly remind you to plan your time properly as you need to pick up your luggage from the hotel and leave for the railway station no later than 18:30. A taxi will cost about CNY10 to Beijing Railway Station from the hotel. To avoid traffic jams, you may choose the subway instead. Walk to Tian'anmen East Station to take Subway Line 1 (to Sihuidong Direction) and interchange Subway Line 2 (Inner Ring) at Jianguomen, and then get off at Beijing Railway Station. Please find the Exit C (Southeast Exit) to leave from the subway station. 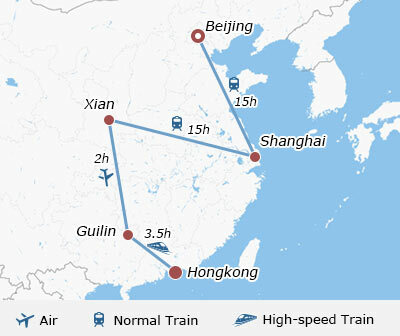 Ride an overnight soft sleeper train departing at about 21:00 to Shanghai on your own. For the train will not arrive in Shanghai until 09:00 in the morning, we suggest you prepare some snacks and drinks for breakfast. There is a dining car available on the train, but the food is just passable and slighly expensive. In order to put your luggage in a favorable position, you'd better go to the railway station and check-in earlier. You can read the guideline of the luggage allowance on the train in advance. And we also suggest you look after your valuable belongings and keep your eyes on your luggage. The train will arrive in Shanghai in the morning. After getting off the train and walking to the main exit tunnel inside the railway station, we suggest you look for the English signpost indicating the direction to the Exit at South Square of Shanghai Railway Station. Following the way to this exit, you can see the station of subway line 1, take it and get off at the next stop, then walk to the hotel we booked for you. You may have a short break or take a shower if the hotel offers free early check-in. 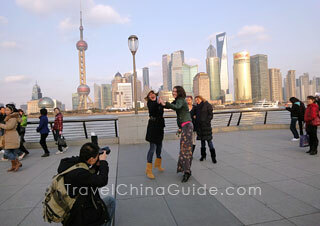 Old and modern, Shanghai is a great city of easy access for one to arrange self-service visit. We suggest you start your sightseeing with the more than 400 years old Yuyuan Garden. You can walk about 30 meters to northwest, turn right, walk for 30 meters, turn left into Hengfeng Road, and then go along this road to Heng Feng Road Han Zhong Road to take Bus No. 64. Please carry small change for the bus ticket (usually CNY2 or CNY3). Get off at Xinbeimen Station after riding the bus for seven stops. Then you are advised to walk along Anren Street to get to the entrance of Yuyuan Garden. We believe you will be impressed by its surrounding old streets and market along the way. It is also advisable to have lunch at eateries hereabouts before leaving for your next destination. A taxi ride only costs flag-down fare (CNY14) will take you to Shanghai Museum, which is a major museum of ancient arts housing 120,000 valuable articles. You can rent an audio guide to learn about those treasures more deeply. Thereafter, we advise you to hail a taxi again at the flag-down fare to reach the prosperous Bund, where you can take some free time to feel the pulse of this great city. The most convenient way for you to get back to the hotel from the Bund area is still by taxi and it will cost you CNY21. We would deliver the train ticket to Xian to your hotel in advance, and you are advised to collect it from the reception. The full daytime is still at your disposal. You can make use of it to visit the Qibao Old Town, which is a popular destination for one to experience old Shanghai culture and taste various delicious local snacks. It is easy to access by subway from your hotel. You can take Subway Line 1 (to Xinzhuang direction), get off at Xujiahui station and then interchange to Subway Line 9 (to Songjiang Xincheng direction) to arrive at Qibao station. Remember to leave from the No. 2 exit from the station. Then walk to the northeast along the Caobao Road for 180 meters, turn right into Mingzhu Road, continue to walk for another 180 meters, you will arrive at the old town. If you are not interested in this town, you may get to the Bund area to take a cruise on the Huangpu River, visit the Oriental Pearl TV Tower, Jin Mao Tower or Shanghai World Financial Center, which are all grouped in the Pudong New Area. Again, remember to buy some light food for the train journey this evening. In the late afternoon, you can get back to the hotel to pick up your luggage and go to the railway station for the overnight train to Xian. When the train gets to Xian in the morning, our excellent local guide will pick you up from the railway station. You will be conducted to the hotel and may check-in earlier if it has vacancies. Being endowed with long history and profound culture heritage, Xian is one of the greatest ancient cities in the world. The Provincial History Museum no doubt best reveals the city's brilliant past by unsurpassed large quantity, rich varieties and high value collections. Our guide will take the remainder morning time to show you this wonderful museum. Please make your own lunch arrangement. 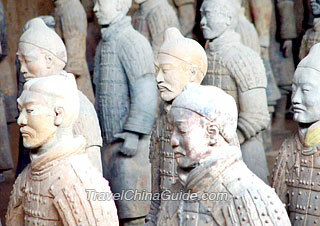 Then you will be led to the Terracotta Warrior and House Museum, which is the main reason for many tourists who ever come to Xian. As one of the significant wonders of the world, the huge underground arrays consisting of thousands of clay warriors and horses, and two precious bronze chariots vividly reproduce the mighty military power that Qinshihuang, the first emperor, once owned. The time in Xian today will be on your arrangement. The first place we suggest for your self-service exploration is the more than 600 years old Xi'an City Wall, which is also a must-go spot for you to touch the city's history. As your hotel is not far from the South Street, you can ascend the wall from the entrance at the South Gate, which is less than 550 meters walking southward from the Bell Tower Crossroad. If you are energetic enough, you can do one or two hours hike on it. Alternatively, you may rent a bicycle or take an electronic car, and the cost for the former is CNY40.00 per person and for the latter is CNY80.00 per person. Then you may walk northward back to the Bell Tower, and go further westward to the Drum Tower. Relax yourself by strolling along the adjoining bustling Muslim Street. It is a compact community for about 20,000 Xian Muslims and famous for its unique Muslim culture, delicious local snacks and interesting souvenirs. Later, go back to your hotel to pick up your luggage and take the shuttle bus to the airport for an afternoon flight to Guilin. The shuttle bus stop is just in front of the Melody Hotel on the other side of the street to the Drum Tower, so you can find it very easily. 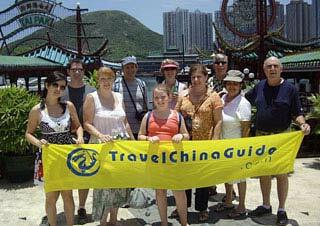 Our Guilin guide and driver will wait for you at the airport and transfer you to the carefully-selected hotel. You will also receive the train ticket of Guilin/ Guangzhou from the guide. There is no better place in China to enjoy natural scenery to its full other than in Guilin. In a certain sort of way, the Li River cruise is the essence of Guilin landscape. This morning, we will transfer you to the pier to board the Li River Cruise ship. 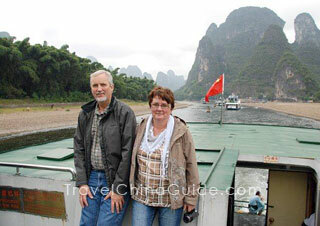 Then the activities during the cruise and in Yangshuo are on your own to enjoy. A dazzling succession of beautiful scenes passes by as you cruise down the Li River to Yangshuo for 4 hours. You'd better have your battery charged fully since the views will occupy large space in your camera's memory. 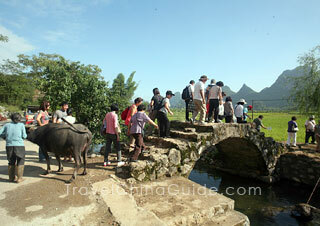 After the ship arrives in Yangshuo, you will first walk across the more than 500 meters antique and modern West Street. In the next 2 hours, you could take an electric car to the nearby countryside, where you can take a look at the pure and simple life that the locals live. Please purchase the bus ticket return to Guilin at the bus station by yourself. Tips: Since the simple box lunch provided by the cruise is not up to TCG's serving standard, you may consider having a hearty breakfast at the hotel this morning. How to manage your time in Guilin today? We would like to suggest you do a self-guided tour to the three most typical sightseeing spots in the city. Walking for about 100 meters to the Binjiang Road from your hotel and moving along the road to its northeast for about 350 meters, you will get to the Feng Qing Yuan Bus Stop. Here you can take Bus No. 58 for just four stops and get off at Reed Flute Cave Stop (Lu Di Yan). Walk back for about 370 meters, turn left and go on for 110 meters more, you will see its ticket office. Reed Flute Cave, a famous Karst formation, is acclaimed as the "art palace of nature". Kindling your imagination, those stalactites in various shapes under the colorful light will make you feel like in a magic world. The next stop you may go is Seven Star Park, which is a comprehensive park with the marvelous landscape of Guilin in miniature. You can return to the same bus stop as where you arrived to take Bus. No 58 (return direction) for five stops and get off at the Seven Star Park Stop (Qi Xing Gong Yuan). After crossing the road, you are advised to walk backward (northeast direction) for about 200 meters to reach the entrance of Seven Star Park. For your information, you can stop for lunch at a nearby restaurant named “Hao Wei Dao” before entering the park. Then you may conclude the sightseeing with a visit to the Elephant Trunk Hill, which is the city's landmark. This spot is still accessible by Bus. No 58 from the Seven Star Park Stop that you just get off. You can take it for only one stop and get off at Xiangshan Park. Then the entrance of Elephant Trunk Hill Park is about 20 meters away. Afterwards, you may take a taxi back to the hotel and the cost is within CNY10. This morning, you can leave for the Guilin West Railway Station to high speed train to Hong Kong on your own. You may walk about 10 minutes upon arrive at Hong Kong West Kowloon Railway Station to the Hotel. As an international metropolis, the public transport in Hong Kong is very convenient for one to get around in. Therefore, we only reserve the hotel for you and you can plan all the activities by yourself. The day is exclusively on your own to feel the glamour of this great city. You may start your exploration with the Victoria Harbor to get a snapshot of the bustling Hong Kong. From your hotel, you can walk for 30 meters to Kowloon Park station to take Bus No. 6 and get off at the Peninsula Hotel station. You will arrive at the Victoria Harbor by walking for 560 meters. Don't forget to try the reputed Star Ferry. It is an oldest sea crossing transportation means to get to the Central on Hong Kong Island. There are plenty of good eateries and cafes for you to dine lunch around the area. Hong Kong is also famous for a shopping paradise, so you might continue to the Stanley Market if you are looking for good bargains. It is accessible from the Exchange Square Station by taking Bus No. 6 or No. 6X to the Stanley Village station. After your shopping spree, you could get to the Wui Cheung Road station which is about 290 meters to your hotel by taking Bus No. 973 for about 2 hours from the Stanley Village station. Alternatively, taking a taxi costs you around HD$100 to the hotel. Your journey now comes to an end. Please follow the hotel rule to check-out before 12:00. The hotel provides airport shuttle bus service. It is available every 30 minutes from 05:40 to 21:40 and you need to reserve seat at least three hours prior to your departure time from the hotel Bell Service Desk. If your departure flight leaves in the very early morning, you can take a taxi and spend about HD$215 to reach Hong Kong International Airport from the hotel. I'm from the USA. Do I need a visa and how do I get one for an overnight stay? Thanks in advance. No, you don't need a visa. So I don’t need anything to spend the night there? I just received another text saying you had answered my 2nd question but I don't see the reply. Also is the PVG airport close to the cruise ports? I need to find a good location to spend the one night before boarding the cruise. Thank you!! If you wanna leave the airport, you need to apply for the stay permit when you arriving at the airport. The distance between the cruise port and Pudong Airport is around 65km. I m staying at the Paramount Gallery Hotel in Shanghai. Where can I buy the 48 hour ticket for the Big Bus Tour? Where can I take the bus from my hotel? I will be heading to Shanghai Disneyland on April 4th, which is the day before Qingming. What kind of crowds will I expect? Is this a national holiday? Don’t worry! The day before the festival is not during a peak time, and there are fewer visitors in weekdays. Oh, it’s a national holiday. Thanks for the response. This is near Easter weekend... does this impact Shanghai schools? As I know, it won’t impact schools, but there may be some activities in Disneyland. I am flying internationally and arriving at CAN at 5 am. Would it be a good estimate to say I will be through customs and luggage by 6am? Part 2 of this question is - are there any place to get food at the arrivals terminal at this time? Generally speaking, 1 hour is enough to finish all the procedures. I happen to know there is a KFC in the first floor, which is open round the clock. Does anyone know how long does it take to travel from Shanghai Disneyland to the railway station by the express bus? And how much? Thanks. As I know there is no express bus between Shanghai Disneyland and Shanghai Railway Station. You can either take a taxi or subway from disneyland to the railway station. For subway, you can take line 11 (North Jiading direction) to Caoyang Road, then change to line 3 (North Jiangyang Rd. direction) and get off at Shanghai Railway Station. The taxi fare is around CNY130 and the ride takes about an hour.